We are getting out this week….as I vowed we would. After we Jived, we joined some buddies for a coffee and one of the ladies had made my Carrot and Ginger cupcakes. She gave me one to try and that little cupcake was deee-licious. Made even more so by the fact that I had solid evidence that someone was enjoying my recipes, and I ate cake not made by me! It’s like the ‘Cup of Tea Phenomenon’….you know how tea always tastes better when someone else made it? I never did work out why that is. Please do remember, dear reader, if you ever need a taste tester, I’m only too happy to oblige – geography permitting, of course. Anyway, down to business. Pork loves fruit. More so than any other protein, in my opinion. Whether it’s dried apricots, apple sauce or peach salsa, the sweetness of the fruit truly compliments the sweet, pork meat. This is another one tray hit that I’ve been making for years. You can mess around with the vegetables that you roast in there but you gotta have the pear. 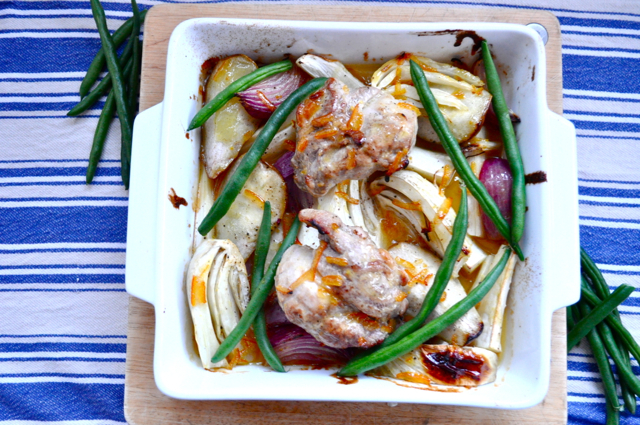 The buttery, marmalade stickiness with the pork and pear are really quite the combo. I’ve found that this combination of flavours really works though, so maybe stick to this the first time if you have the ingredients. This is not so much for the kidlets today, but there is certainly nothing in there that they can’t eat. I serve this with roast, smashed potatoes dotted with fennel seeds. Fennel is another dear friend of the pig. I also serve it with steamed green beans for the green factor. 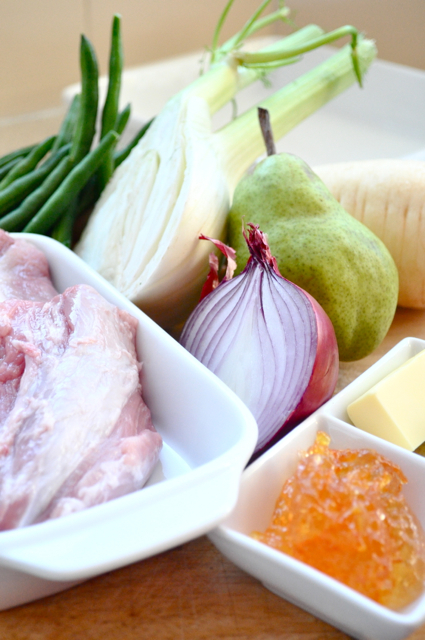 Place the onion, fennel, parsnip and pear into a baking dish and season. Drizzle with olive oil and roast for 15 minutes. In a hot frying pan quickly sear the pork for a minute or two minutes on each side. Combine the marmalade, butter and mustard in a bowl and mix together. Place pork on top of your roasting tray and spoon the marmalade mixture over the lot. Roast the pork for about 10 minutes for fillet, and 8 minutes for cutlets or medallions, or until pork is caramelised and cooked through. Pork should be served with a little blush of pink in it, not grey and pallid. THis reads very tasty indeed! Could you use a milder mustard to suit children? Does she?? My mum taught me this years ago. I wonder if it’s the same recipe??? I do love me some pork. So tasty and affordable! She doesn’t have the Fennel in it though. I’m not a lover of Fennel so I use baby Carrots instead. It’s an easy dish & very flavoursome. What’s Weird About Attachment Parenting and Human Cheese?